When you stay at La Playa Carmel in Carmel, you'll be near the beach and minutes from Golden Bough Playhouse and Carmel Beach. 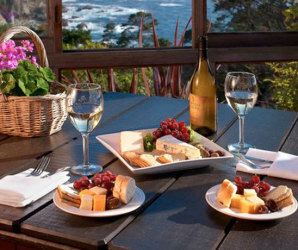 This hotel is within close proximity of Galante Vineyards and Scheid Vineyards Tasting Room. Make yourself at home in one of the 75 guestrooms featuring minibars and flat-screen televisions. Cable television is provided for your entertainment. Conveniences include complimentary newspapers and coffee/tea makers. Take advantage of recreation opportunities such as an outdoor pool or take in the view from a terrace and a garden. Additional features include complimentary wireless Internet access, wedding services, and tour/ticket assistance. Featured amenities include express check-out, a 24-hour front desk, and multilingual staff. Planning an event in Carmel? This hotel has 3475 square feet (323 square meters) of space consisting of conference space and meeting rooms. Free self parking is available onsite.